2018 MV Agusta F3 800 RC. 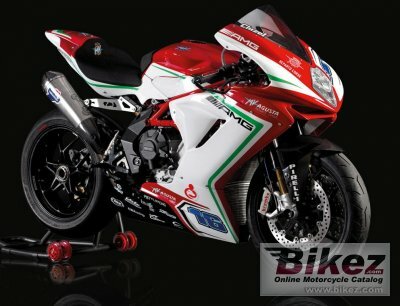 Picture credits - MV Agusta. Submit more pictures. The advanced MVICS electronic platform (Motor and Vehicle Integrated Control System) allows the rider to effectivly manage the performance utilizing the Ride by Wire system together with the available multimaps (three predefined maps and one fully customizable map) together with 8 levels of traction control. Front brakes: Double disc. Brembo radial-type monobloc, with 4 piston. Optional ABS..
Rear brakes: Single disc. Brembo with 2 pistons. Optional ABS. Comments: Ride By Wire system. Motor and Vehicle Integrated Control System. Limited edition of 100 numbered and certified bikes. Ask questions Join the 18 MV Agusta F3 800 RC discussion group or the general MV Agusta discussion group. Get a list of related motorbikes before you buy this MV Agusta. Inspect technical data. Look at photos. Read the riders' comments at the bike's discussion group. And check out the bike's reliability, repair costs, etc. Show any 2018 MV Agusta F3 800 RC for sale on our Bikez.biz Motorcycle Classifieds. You can also sign up for e-mail notification when such bikes are advertised in the future. And advertise your old MC for sale. Our efficient ads are free. You are also welcome to read and submit motorcycle reviews.